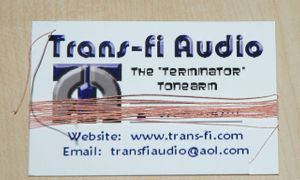 Transfi Audio Shop. Scroll down to see items on offer. I recently needed a cheap & cheerful strobe disc myself, but you think I could find one? In the end I downloaded a strobe pattern & made one myself. Sure, you can do the same, but by the time you've downloaded, got the thicker card paper, laminated, punched & trimmed its a lot less hassle to buy one off me! I also have a lathe to trim it round! These strobes are printed on yellow card paper then laminated with 250 Micron clear plastic. They work really well using using a small lamp to light the disc. (Note the lamp used must see AC current at the bulb & not DC because these strobes work by detecting the frequency of the alternating mains current). They are well trimmed & durable. 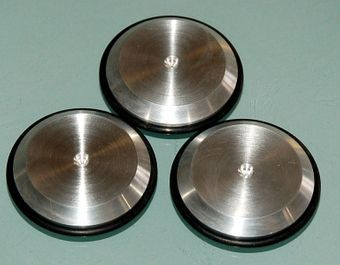 Caters for 33, 45 & 78rpm both in 50hz & 60Hz mains frequency. Also small enough to fit inside the record label so can be used with the record playing. -Use in a dark room with the only light being the lamp used to light the strobe. -Ensure you are using a lamp with AC at the bulb. The strobe relies on mains AC which pulses. Some Halogen lamps convert mains AC to DC so THIS WILL NOT WORK. If in doubt use a desk lamp with filament bulb, altho these are getting rarer & rarer. Low energy bulbs & flourescent bulbs will not work. -Focus your eyes on the appropriate ring, eg, for UK @33rpm use the outermost ring. 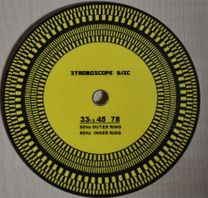 The individual marks will appear as a blur if not exactly 33rpm. You will start seeing the strobe marks as you approach the correct rpm while adjusting your motor speed control. If the ring is appearing to move clockwise it is fast, anticlockwise is slow. Stationary is spot on. NOW EASIER TO FIT WITH CRIMPING FACILITY. Extra tag included for practice! I have spent alot of time trying different tags & found these to be the best maintaining excellent contact with the cartridge pins even after repeated insertions. They are made of gold plated copper alloy & are also competitively priced! Most of these type of tags are normally made to fit 0.04 inch diameter cartridge pins. 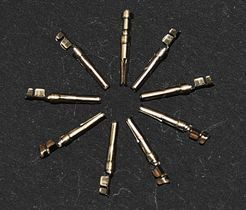 However, almost all cartridge pins are actually made at 0.05 inches. This results in much effort for insertion and you almost always must resort to pliers. These tags are made to fit 0.05 inch pins. They are gold-flashed for improved conductivity, and come in a more convenient to grasp length of 0.577 inches. For added durability, the tag ends have a metal wrap-around strain relief. Full fitting instructions from this pul-down menu. Crimp can easily be snipped off for direct soldering if desired. 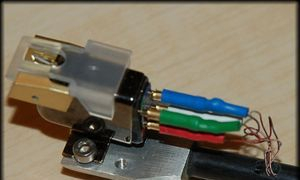 Ideal for tonearm re-wireing. This material is friendly to work with, very strong, yet supple. 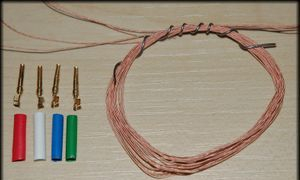 Consists of 30 strands of .04mm copper wrapped in silk thread. It is easily colour coded using felt tipped pens & takes readily to solder. The best way to tin the ends is to just heat it with the soldering iron whilst applying solder. The silk will burn off & leave a residue which you can remove with your fingers (once the wire has cooled off). Have a damp sponge nearby to wipe the soldering iron tip on. The heat also fuses the silk so it wont unravel. 4 meters quality Litz wire consisting of 30 strands of .04mm enamelled copper wire. Total diameter 0.3mm. 4 + 1 gold plated copper alloy cartridge tags with crimps*. The crimps can be shortened or removed with scissors and the wire can be soldered direct to the body of the tag if you wish. 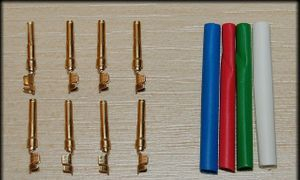 Coloured heat-shrink which you cut to size to give that professional finish. You will require a source of heat to shrink. A length of extra fine solder to do the job. *Most of these type of tags are normally made to fit 0.04 inch diameter cartridge pins. However, almost all cartridge pins are actually made at 0.05 inches. This results in much effort for insertion and you almost always must resort to pliers. These tags are made to fit 0.05 inch pins. They are gold-flashed for improved conductivity, and come in a more convenient to grasp length of 0.577 inches. For added durability, the tag ends have a metal wrap-around strain relief. A note on the Litz wire: This consists of individual strands of enamel insulated wire. Conductivity will not occur until the wire end is tinned. This will breakdown the insulation & render it conductive. The silk covering is only meant to hold the bundle together, not to insulate. If this cover is deficient in certain areas as can happen during the manufacturing winding process it in no way affects the performance or insulative properties of this wire. See pull-down menu under SHOP for full instructions on how to handle this wire. I use these materials exclusively in my parallel tracking Terminator tonearm. Testimonial on Litz wire....... 'against original internal wires the sound is more controlled on the top, ridiculous highs I didn't know were there. 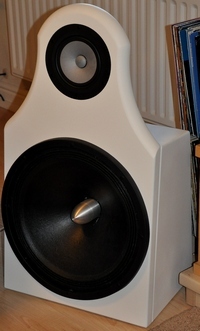 The mid is nicely projected and bass extension is excellent' See my other listings if you wish to purchase wire or tags separately. Does not include cartridge or tonearm. Extra tag to practice on! I have spent alot of time trying different tags & found these to be the best maintaining excellent contact with the cartridge pins even after repeated insertions. Most of these type of tags are normally made to fit 0.04 inch diameter cartridge pins. However, almost all cartridge pins are actually made at 0.05 inches. This results in much effort for insertion and you almost always must resort to pliers. These tags are made to fit 0.05 inch pins. They are gold-flashed copper alloy for improved conductivity, and come in a more convenient to grasp length of 0.577 inches. For added durability, the tag ends have a metal wrap-around strain relief. Full fitting instructions under SHOP tag. 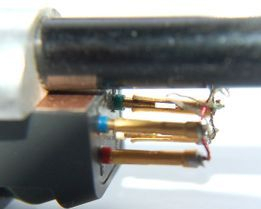 COPPER LITZ TONEARM WIRE Ideal for tonearm re-wiring. This material is friendly to work with, very strong, yet supple. Consists of 30 strands of .04mm copper wrapped in silk thread. The overall diameter of this wire is 0.3mm. Full instructions on how to handle this wire under SHOP tag. I have tried all sorts of tonearm wires & found this the easiest to work with giving the most consistent results. I found the plastic coated Cardas type stuff hard to strip , & tinning the wire left a messy end to the insulation which does not withstand the heat. Please select the number of meters you require. Can be used with Transfi feet, or any other type. 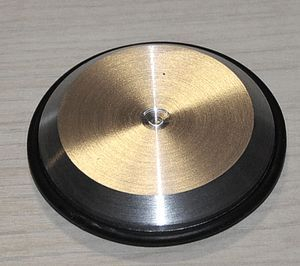 Consists of 8mm aluminium disc, 40mm diameter with a bevelled shoulder. Central dip to locate spike. 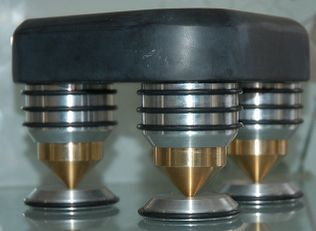 Rubber Captive O-ring on the base provides Isolation & prevents slipping/scratching. Outer O-ring provides further damping, but this can be removed if you prefer (see pics). Item is priced singly so you can chose how many you need. 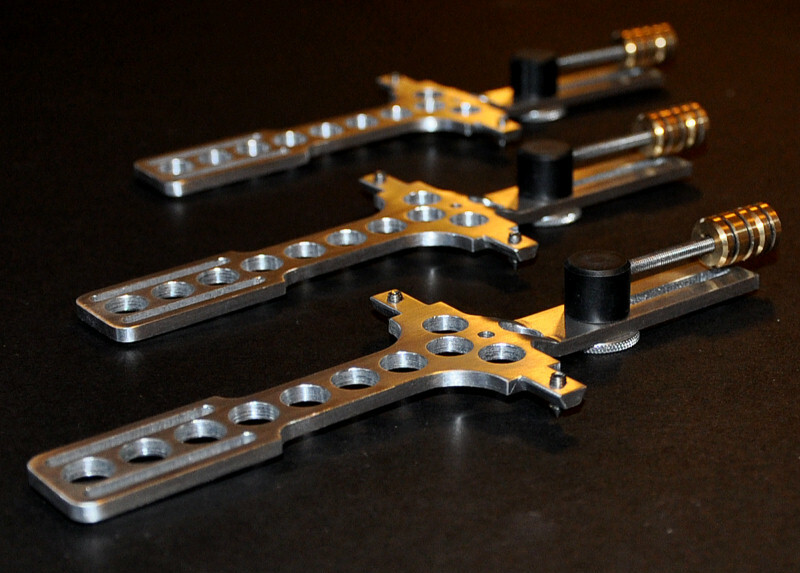 Manufactured in UK, keeping our machine shops in business! NOTE: Pictures showing isolation discs together with feet are for illustrative purposes only. This listing is for isolation discs ONLY. The feet are SOLD OUT. 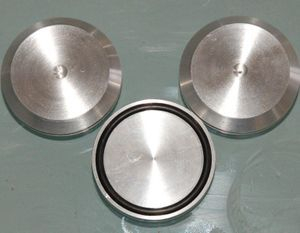 2 SIZES: 300mm & 286mm (Technics/Garrard) Measure the diameter of your platter so see which suits. As a vinyl enthusiast, I am always looking for ways to extract the most information from the record grooves. Many of you know about my Terminator tone-arm & Tomahawk wand which have received wide acclaim from many fellow enthusiasts. 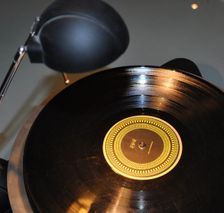 More recently, the new Salvation direct rim drive analogue control turntable is also starting to make an impression. 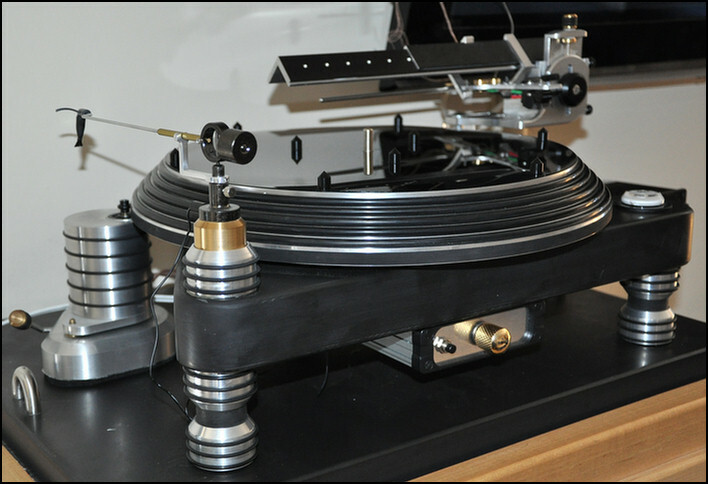 Many of us have been following the school of thought that clamping the record solidly to the platter is a good idea, giving a more solid bass & flattening out warps. I myself have been guilty of the same.However, there is another school of thought that says clamping is NOT a good idea. 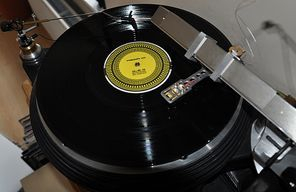 Clamping to a rubber mat deadens the sound too much making the record appear dull & lifeless, and clamping to a solid mat or surface, like acrylic, causes energy from the stylus to be reflected back into the record, thus colouring the sound. I have always maintained clamping to acrylic gave the most dynamic & clean sound, but when I recently increased thickness of my 3mm acrylic platter mat to 12mm, I noticed a hardness creep in, perhaps due to frequencies being reflected back from the acrylic. I decided to experiment with the other school of thought & decouple the record as much as possible from the platter. This inspired me to develop a mat which represents the antithesis of all that is right with clamping.....and you know what......it works! First, a clamp is needed to flatten out warps. Well, it may flatten mild warps at the center of the record, but the outside will still be wavy unless you also use a periphery clamp. What actually happens in practice is you get voids under the vinyl, so some parts of the record are in contact with the platter, other are not. In any case, forcing a warped record flat is bound to strain & distort the shape of the grooves so you will get an inconsistency across the record. I find most good setups will play moderately warped records with no problem. 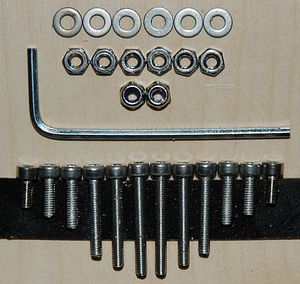 Second, clamping is necessary for good bass. For those that may say clamping a record improves bass, I say think again. Bass is more bloated so may appear increased. Again, all you are hearing with a clamp is colouration & reflections. Third, a clamp is necessary to prevent record slippage. I had set up a measuring device to test this theory, played a whole record side @ 2g with a Paratrace stylus (much drag) to find to my surprise no movement occurred. Enter the Reso-Mat. The idea with this mat is to have absolutely no influence on the record. It sits on cones with minimal contact with no clamping. Vibrations from the stylus are free to dissipate in the open air with no reflections. There is nothing to dampen the record either. The net result is a super clear dynamic portrayal of the music with extreme detail retrieval. Treble that seemed harsh or sibilant on some recordings is greatly tamed. Modern recordings done in the digital domain are rendered listenable....& I have a pile of those which I am now rediscovering! Bass becomes cleaner & more distinct. If a deep bass note is present, and your system is capable of producing deep bass, the floors will still shake. Another effect of this mat is to increase the noise floor. Not only are the cones stopping reflections from the record, but also minimising noises from the environment & drive mechanism of the turntable, be it motor or bearing, from getting through to the stylus. Less external noise has the effect of opening & widening the soundstage. I have to say this mat represents a good time spent in R & D with different cone materials. Wood was rejected, for instance, as the bass disappeared! Softer materials such as rubber & cork were also rejected because the damping they caused resulted in a loss of detail. 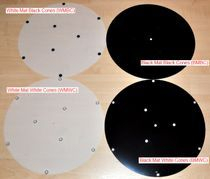 The polyvinyl used for the Reso-Mat cones is similar to the vinyl the record is made from & gave the best results. - the platter really rings without the rubber mat but only rings little when tapped on the side with Reso-Mat & record in place. My instant reaction is that the sound is so much more like my Salvation reference deck........ this is with a Shure M95ED! Loads more clarity, much tighter, bass is much more correct (not bloated) and detailed. A serious upgrade. I've played with loads of mats over the years but always ended up back with rubber, your new mat has transformed the deck. Hey, Vic! I think this is a fenomenal tweak! There is so much more detail! It is a big upgrade indeed! And now I have the silence of a belt drive too! The best of both worlds. .......your new reso-mat is a perfect combination at least in my system. It is now easy to hear the position of the instruments without the drawback of a "separated" sound. A strange thing happened: listen to speaker with no time alignment and you will feel that the soundstage is sort of tilted with the lower octaves right in front of your listening position and the highs way back. A good time alignment will sort this out with the position of bass right under the high frequencies. This is exactly what reso-mat did. Articulation of bass is very clear and timing is just perfect. I think it has to do with coloration of the mat as you stated. Thank you, really a big improvement. A few clients have reported back to me that Resomat did not suit their system because they could hear the stylus passing over the cones. This is in fact showing how effective Resomat is at isolation because noise intrusion from somewhere in the setup was being focused only where the points contacted the vinyl. This was never noticed before as it was always present & part of the background noise. Troubleshooting back through the system we were able to trace the source in one case to a dry bearing & another from resonance coming up through the floor. When both these sources were eliminated the noise from the cones disappeared & the clients were rewarded with the best presentation their systems had ever given! The mat material is made from 350 micron polyethelene. It is very thin & unsupportive by design so as not to impart any sonic signature to the record. Its purpose is solely to provide an even spacing for the cones. In fact I have some clients who have dispensed with the mat & siliconed the cones direct to the platter. Platters with a recess under the label area & lips around the edge may need an appropriate amount of packing. You will need to improvise here. Metal/rubber/nylon/ washers or coins under the mat will work fixed with double sided sticky tape or cut out a cardboard doughnut of the right thickness that will pack the recess. Feedback from clients would suggest that the Reso-mat retrieves more detail from the record when in direct contact with the hard surface of the platter. Alternatively, the mat can be used spikes down which has the effect of increasing the bass slightly, but with a marginal reduction in focus. The mat is laid directly on the platter & is not glued down or retained in any way. Resomat will add 5mm to the surface of the platter & replaces the original mat. With most mats being 3mm or so, this mat will effectively add 2mm to the overall height. Please ensure your are able to adjust VTA on your setup to accommodate. There is also a 12mm version developed exclusively for my Salvation deck, but available if anyone is looking for a tall mat. The 5mm version will be sent out as standard unless notified otherwise. The Reso-mat is professionally engineered. The cones are CNC'd to my specifications & are fixed to a very thin polyethylene laser cut mat by means of retaining O-rings. The idea of the mat is simply to hold the cones in position & is designed thin to be sonically inert. clamp in favour of the Reso-Mat. Of course, being a realist, if you find the mat does nothing for your setup, please return in original packing within 7 days for a full refund less postal charges. The cones are of the same hardness as vinyl, so will not scratch it. Black is unfortunately a dust magnet. Use a soft brush to remove. White easier to maintain. Fingerprints are easily removed with LCD screen cleaner & a soft cloth. I tested for slippage with stylus drag, cleaning brushes & dustbugs early on in the Reso-mats development & found it not to be an issue.